How often and at what times of year do you conduct training sessions? Cornell College and the University of Iowa both hold two bigger training sessions each year, once in the winter and once in the summer. Smaller training sessions are held throughout the academic year as need. The University of Northern Iowa does the majority of their training during the summer, with about 8-10 shorter sessions scattered throughout the year. At Cornell, trainings are coordinated by the Director of Admissions, with occasional assistance from the Vice President. At UNI, a senior transfer counselor coordinates training sessions, and one of the senior counselors at Iowa is in charge of staff training. How do you decide what topics to prioritize in training? Most admissions offices prioritize trainings based on the needs of their counseling staff. New majors or programs that staff haven’t heard from in a while are often popular choices. For example, this year’s winter training at the University of Iowa included presentations from two new majors: Neuroscience and Data Science. Programs that have new selling points are popular choices as well, especially if a program has a new building or space that staff can tour. Marcus Phillips from the University of Iowa shared that it’s also important to cover topics that are constant in the admissions process, like policies, office procedures, and financial aid. Tom Heiar from UNI mentioned that they will also meet with campus partners about new initiatives that are in the works, including potential new majors, so that counselors know what might be on the horizon. Drew Shradel shared a great list of questions that the admissions team at Cornell College asks as they figure out what to prioritize in training: What is something new that we are trying this year? Is there anything new that we’re wanting to accomplish this year? Do we have a lot of new staff that will need some more basic training? Is there a trending topic or big issue in higher education that we need to focus on? Based on the answers to these questions, raining sessions are often completely different from year-to-year. What is one of the most unique sessions you’ve had? Admissions staff from Cornell College took a campus tour at the University of Iowa to learn about another nearby institution. They also met with development groups in both Cedar Rapids and Iowa City to learn more about the communities surrounding their campus, and how the communities may impact a student’s decision to attend. The UNI Admissions team did hands-on work with their Department of Technology, showcasing the facilities that students use each semester and completing projects with their staff. They also heard student testimonials from the Art Department about job opportunities after graduation. 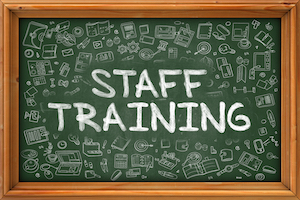 Staff training is a great way to connect with our colleagues, learn more about our institutions, and grow as professionals. By sharing our training ideas with others, we can come up with new, creative ways of keeping our staff informed and engaged to best help our students.